Volunteers fly into Ulaanbaatar airport early in the morning. After a short walk off the plane through to the arrival lounge, you will be greeted by a Projects Abroad member of staff. You'll jump in a car, and head for your accommodation. Host families are friendly and eager to learn all about our volunteers. They are middle class families who live in good accommodation (usually apartments) around the city. 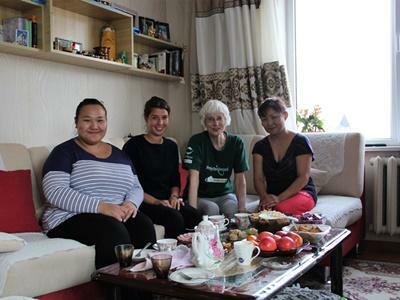 After a good night's rest and some home made Mongolian food, a member of staff will pick you up the next morning for your tour of the city. All the normal stops are included - you'll be shown where to change your money, the post office, internet cafés (yes they do exist even in Mongolia! ), and important landmarks. Our staff are eager for volunteers to see as much as possible, so they may take you to the museum or to the local monastery to visit the monks! You'll have some lunch and perhaps meet up with some other volunteers. Depending on the time and your program, you may be introduced to your placement during the afternoon. If not, a member of staff will pick you up and take you the next day. Most volunteers live only a short distance from their project, so will be able to walk to work each day. Buses are the quickest, cheapest, and most popular form of public transport, and they go everywhere in Ulaanbaatar. Taxis are also relatively cheap to use. If you are volunteering on a Standard Project, all necessary work-related transportation costs will be covered by Projects Abroad. Mongolians eat lots of meat - mainly beef and mutton in dumplings. This is served with rice and vegetables, which includes potatoes, carrots, cabbages, and onions. Stews are also very popular. If you would like a change, Ulaanbaatar even has Italian, Indian, and Thai restaurants. Because of their close proximity and history, Chinese and Korean food is also widespread. It is certainly possible to be a vegetarian in Mongolia, but you will have to keep explaining! Finally - be warned, karaoke is big in Mongolia; this is something you should experience at least once (but maybe not twice! ).